The “Precious Jewels” display, which is located on the third floor within the museum’s core exhibition, Sing Me Back Home: A Journey Through Country Music, spotlights a handful of seminal instruments upon which much of the foundation of American music was created. Other instruments on display as “Precious Jewels” include Mother Maybelle Carter’s Gibson L-5 guitar, Lester Flatt’s Martin D-28 guitar, Bill Monroe’s Gibson F-5 mandolin, Jimmie Rodgers’ Martin 00-18 guitar and Hank Williams’ Martin D-28 guitar. The Granada was acquired by Scruggs in a trade with Don Reno in the late 1940s, and he used it on the 1949 recording of his composition “Foggy Mountain Breakdown” by Lester Flatt, Earl Scruggs & the Foggy Mountain Boys. The song was a showcase for Scruggs’ astonishing speed and clarity on the instrument. He continued to use the Granada on the road and in the studio with Flatt & Scruggs and the Earl Scruggs Revue, and he played it for the rest of his life. Over the years, modifications and repairs to Scruggs’ favorite banjo included refitting it with nickel-plated hardware, replacing a warped neck, and adding cam-style “Scruggs tuners” to the peghead that were subsequently replaced by mechanical D-tuners. In 1988, Gibson restored the Granada’s resonator to its original sunburst finish and installed a curly maple neck in the style of the original. 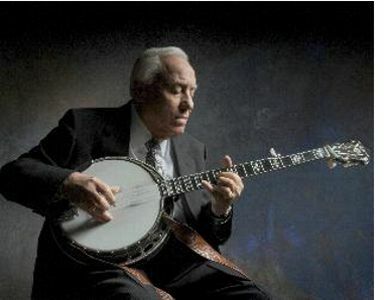 Another significant banjo in the life of Earl Scruggs was the one upon which he learned to play. This instrument, an open-back 5-string banjo manufactured circa 1900 that belonged to Scruggs’ father, will be on display in the Earl Scruggs Center, which is scheduled to open in Shelby, North Carolina, in late 2013. Few figures loom larger in the history of American music than Earl Scruggs. His revolutionary approach to the five-string banjo transformed an almost forgotten instrument into an immediately recognizable element of a new genre, which later became known as bluegrass. Ultimately, Scruggs demonstrated the banjo’s utility as a lead instrument in many musical styles, and he became synonymous with virtuosity, creativity and an untrammeled willingness to experiment and innovate within and beyond a traditional framework. A Grammy-winning member of the Country Music Hall of Fame and the International Bluegrass Music Association’s Hall of Fame, a recipient of the National Medal of the Arts and a Hollywood Walk of Fame honoree, Earl Scruggs is remembered as a true American original. More information about the Country Music Hall of Fame® and Museum is available at www.CountryMusicHallOfFame.org or by calling (615) 416-2001. More information about the Earl Scruggs Center is available at www.EarlScruggsCenter.org or by calling (704) 487-6233.